HABITechno is biennial conference started in 2013 and will be held again in 2017. This conference is focused on innovative solution in concept and practice of contemporary technology for housing and settlement development, particularly for low income dwelling in developing country. 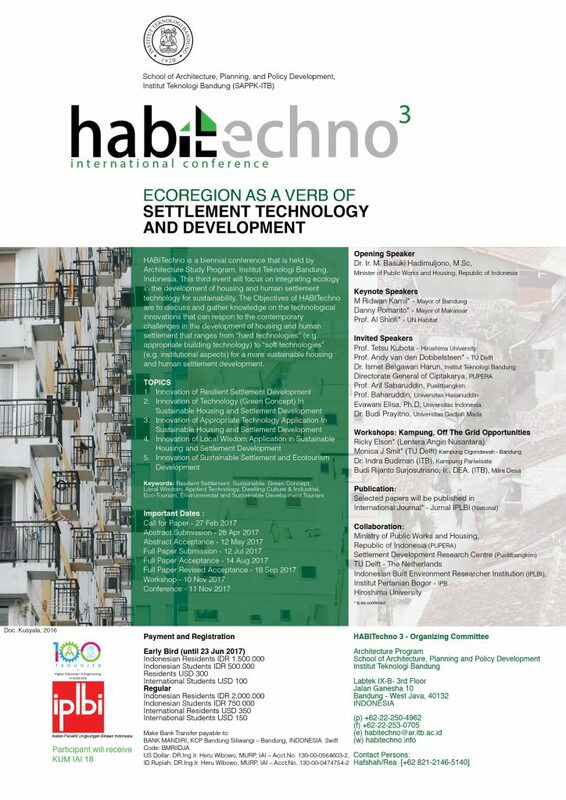 HABITechno is an initiative from Department of Architecture, School of Architecture, Planning and Policy Development, Institut Teknologi Bandung (ITB) collaborates with other institutions in Housing and Settlement and Building Technology in Indonesia and abroad. This theme was selected because of numerous aspects in technology and environment, particularly in sustainable development in housing and settlement development which hadn’t been explicitly delivered. This seminar attempts to integrate technology into design, housing procurement and settlement improvement. Result from this seminar is expected could be an input for housing and settlement development guidance in the future. For more information and Call for Papers, please visit our website.